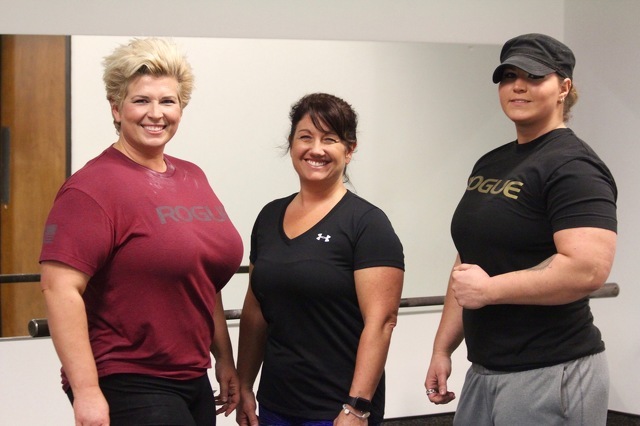 Charlie Rochelle Dubbs (left) leads a team of powerlifters including Karen Liddick (center) and Cassidy Comly (right). Charlie Rochelle Comly-Dubbs grew up in a gym. "I went everywhere with him," said Dubbs, the oldest of seven children. "He would show me off ... He had me deadlifting 135 pounds when I was in kindergarten." By 15 she was setting world records for her age class. 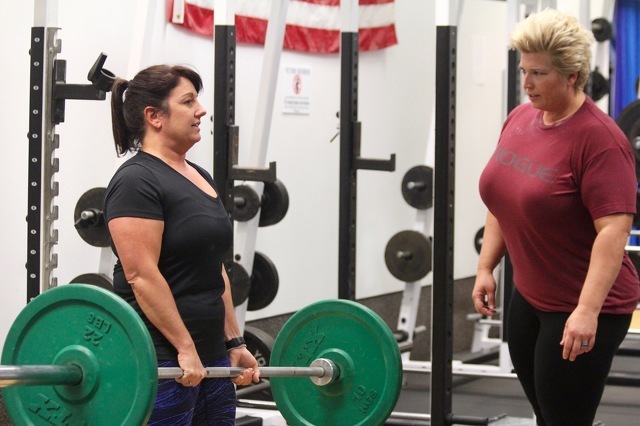 Today, though she still turns to her dad for a push and advice, Dubbs, of Julian, trains and leads a small team of local women who are setting state, national and world powerlifting records. 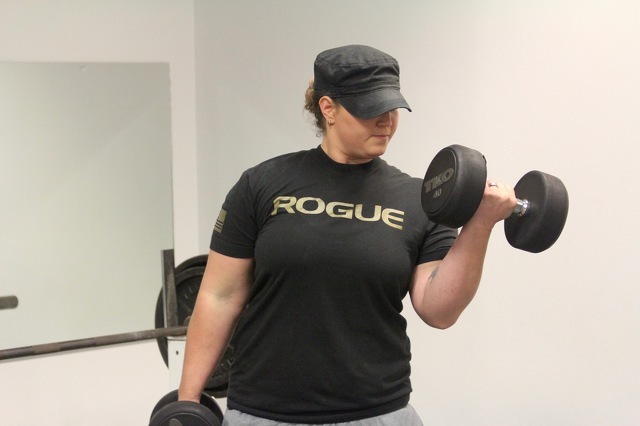 Dubbs got away from lifting after she got married, but health issues, and her sister Cassidy Comly, inspired her a little more than two years ago to get back to it. Last year, Dubbs established a world record for her age and weight class in the bench press for the Raw Powerlifting Federation, where she's ranked No. 1 in the event at the master level. She had been suffering from serious migraines and vertigo and at one point couldn't get out of bed for six weeks. "I ran the gamut of testing and doctors," she said recently while working out at Victory Sports and Fitness in State College. "I was on nine pharmaceutical drugs twice a day. Finally, I thought, I have to do something about this." It started with a year of cardio work, but ultimately Comly helped her remember what she really loved. "I tried to lean out and look like everybody else. I’m not built like everybody else," she said. "I saw Cass and the lightbulb went on. I’m ready to compete again. Let’s do this." The sisters began training together and in short order started to establish themselves as elite, world-class powerlifters, among the best in the state and the country while competing in Raw Powerlifting and USA Powerlifting. At their first meet back, in 2016 in Virginia, both set records and they've been training together ever since. In the past year and a half, Comly, of Howard, has established the top two Pennsylvania records in the bench press for her class, and Dubbs has the top three in hers. The same goes for the strict curl. In the USAPL they're ranked in the top 5 percent of 621 lifters and are the top two ranked lifters in the bench press in Pennsylvania. Dubbs expects to begin competing in the dead lift and squat this year. "We’ve only been benching for two years, and a lot of these people that are top in the world have been doing it for a really long time," Comly said. They've also picked up some prestigious recognition. Both were nominated for the Arnold Schwarzenegger Sports Festival taking place this month, but when they were prepared to travel last fall to finalize their participation, Hurricane Harvey forced them to turn back. So they're attending this year, but expect to compete next year. Dubbs, meanwhile, was invited to Westside Barbell, the invitation-only gym of Louie Simmons, "the godfather of powerlifting." "You cannot even imagine how excited I am. You have to try out to even lift at his gym," Dubbs said. "He’s involved in so much science to develop new equipment. To be able to stay in a room with that man, he is just frank and you have to be able to take it." While training together, Dubbs and Comly sometimes compete separately, with Dubbs in the master class, and sometimes head-to-head. "For the two of us to cross over together in the same class, it’s wicked competition," Dubbs said. "We push each other pretty hard. People get a kick out of following us. Body weight-wise we’re very similar and our muscle mass almost to the ounce is the same. Really it is down to sheer will in what we’re training and how we’re training." The familial competition drives them in their training as well. "We’ll try to out-bench each other and get more reps than each other to the point where we’ll almost pass out doing it just to try to beat each other. It gets a little ridiculous," Comly said. They also like the competition to be unadulterated. Both Raw and USAPL are 100 percent drug-free. "They’re very adamant about drug testing and that’s the way we like it," Dubbs said. "We like to compete head-to-head with hard work." Dubbs and Comly aren't alone in their efforts either. Others have trained with them, including a couple of male lifters. Dubbs' daughter Rylie has trained with them as well and set a state strict curl record for the 12 to 13-year-old class in her first competition. Both Dubbs and Comly are mothers -- Dubbs with a 10-year-old son and now 15-year-old daughter, Comly with stepkids ages 8 and 10 -- and both work at Penn State, where Dubbs is a financial assistant and Comly a custodian. Most recently joining them has been Karen Liddick, of Lemont. She also works at Penn State, as an IT project manager for World Campus, and she has four grown children and three grandchildren. "It’s been awesome," Liddick said of working with Dubbs and Comly. "They took me in as their grandma. It’s been a lot of fun and they’re encouraging. I guess I was tired of trying to always lose weight to look like everybody else and I realized being strong is much better. Both of them encourage that." The 5-foot tall Liddick started working with Dubbs in October and two months later, at her first meet, she set a state record. Dubbs expects Liddick, who in a short amount of time was benching her body weight, will join her and Comly at national and world championships later this year. Liddick had been doing triathlons and lifting on her own, but was looking for her next challenge. One early morning last fall she overheard Dubbs talking to a male lifter about getting into competition and asked if she would train her. "Rochelle keeps me accountable too, and it helps me be more dedicated in other parts of my life," Liddick said. "I don’t want to let her down." "And it goes both ways as a coach," Dubbs said. "If she doesn’t get better, I’m failing as a coach. We’re tracked as athletes on a graph and anyone can look us up publicly. If that graph isn’t going in the right direction, we’re doing something wrong." Karen Liddick (left) trains with Rochelle Dubbs at Victory Sports and Fitness in State College. Dubbs, Comly and Liddick train six days a week, usually in the early morning at either Victory Sports and Fitness or East Coast Health and Fitness. Their training goes in six to eight week blocks, depending on what their current goals are, transferring between high-volume and low-volume and working on two body parts per day. They can be so dedicated that Dubbs has to remind Comly and Liddick to respect the rest day. "It’s imperative you allow those muscles to rest, otherwise you just tear them down," Dubbs said. "We need to build strength and size." That dedication is because, for each lifter, the benefits go beyond simply building strength. Comly overcame thyroid cancer at the age of 21 and knows there are other health issues such as high blood pressure and diabetes that run in their family. So, as it is for her sister, lifting has been her best route to being healthy. But it also has other positive impacts as well. "Some people go to therapy in an office with a licensed therapist. I go and lift weights," she said. "It makes me feel better. It makes my body feel better. It makes my day. I can’t go home and settle down without going to the gym first. Since we usually work out in the morning, it just sets the tone of my day in the right way. "It helps with anxiety too. If you’re in a situation and there’s some anxiety and anger it really helps work that out." Dubbs, too, said if she doesn't go to the gym, she feels lousy the rest of the day. There's also a refreshing truth to lifting. "The weights don’t lie. If you can’t lift the weight, you can’t lift it," she said. "It is a cold hard truth. You put the work in or you don’t. It really plays out when you’re in a meet. You go to a meet and it’s all mental. You have to prepare yourself mentally and physically to be able to go on that stage in front of everybody and throw the weight up. "It’s a hard game, but it’s very rewarding, especially when you’re there with a team like this." Locally, there's a camaraderie among lifters. Dubbs said she appreciates and supports recreational lifters, but there's a special bond among competitive lifters. "You see a competitive lifter come in and there’s just a certain look and a confidence that you know who they are, and right away you gravitate toward them," she said. "And they’re always very supportive and respectful." For those looking to get started in weightlifting, Dubbs has some advice. She said finding a good coach, mental preparation and commitment to the work are keys. "Start by learning the proper form first. The weight will come. Never lift with your ego, you’ll only end up injured and sporting nothing but that broken ego in the long run," she said. "Lift smart, it will change your mind, body and essentially your life.